LIÉBERT, PHILIPPE (baptized Philippe-Pierre), painter and wood-carver; b. 9 Aug. 1733 in Nemours, France, son of Philippe Liébert and Anne Des Porques; m. 31 March 1761 Françoise Lenoir, daughter of Vincent Lenoir, a joiner, in Pointe-aux-Trembles (Montreal, Que. ), and they had ten children; d. 27 Sept. 1804 in Montreal, Lower Canada. It is not known when Philippe Liébert arrived in New France, or under what circumstances, but in 1760 his name was recorded in the ledgers of the parishes of Saint-Pierre-du-Portage (Assomption-de-la-Sainte-Vierge), at L’Assomption, and Purification-de-la-Bienheureuse-Vierge-Marie, at Repentigny. In 1760 and 1761 he made a retable (the structure that housed the altar) for the church at Repentigny, probably in collaboration with Antoine Cirier*. The tabernacle, which has predellas decorated with foliated scrolls and scallops, is surmounted by classical columns with pedestals and entablature, a projecting monstrance, and a recess above two reliquaries. To execute this early piece of work Liébert had drawn inspiration from both Gilles Bolvin*’s exuberant style and Cirier’s more delicate approach. The work as a whole gives an impression of timidity and lack of experience. Subsequently Liébert used this type of composition only in side altars. The retable in the church at L’Assomption, which was begun at the same time but completed later, in 1764, gave Liébert an opportunity for refinement. After drawing the plans for the tabernacle, the balustrade, and the base of the altar, he carried them out in a style that has been described as “rather ornate Louis XIV, crossed with Regency motifs and accented with certain Louis XV details.” He also furnished for the parish six candlesticks, the side altars, and the pulpit. But it was from 1764 that Liébert undertook his first major piece of work: the decoration of the sanctuary in the church at Sault-au-Récollet (Montreal North), which was completed only in 1793. 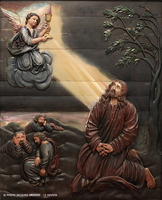 For it he carved a retable “in the Recollet style” that falls within the tradition introduced by Claude François*, named Brother Luc, notably in his work for the chapel of the Hôpital Général of Quebec in 1671. The retable is characterized by four columns (two of which bear the baldachin), sacristy doors with painted reliefs, and vaulting with carved trusses. Liébert had freed himself from the influence of Bolvin and Cirier, and this retable gives proof of an important evolution in his style. These early contracts made Liébert known, and he became the fashionable wood-carver in the Montreal region. He supplanted Paul-Raymond Jourdain*, dit Labrosse, who died in 1769, and Cirier, who became mired in debt and sank into oblivion. In 1765 he received the contract for making a pulpit, a churchwardens’ pew, and stalls for the church of Notre-Dame in Montreal. Five years later he carved the hands of the big clock at the Séminaire de Saint-Sulpice in Montreal, and the following year he executed the three retables for the church of Saint-Louis at Terrebonne. In 1777 he carved and decorated with bas-reliefs a tabernacle consecrated to St Joseph for the Religious Hospitallers of St Joseph of the Hôtel-Dieu in Montreal. Between 1783 and 1791 he executed for the church at Varennes an altar, a tabernacle, and frames for four recent paintings by François Malepart* de Beaucourt. From this point on Liébert had complete mastery of his art. With his apprentices, among them Joseph Pépin* and Urbain Desrochers*, he now turned out his principal works. At Saint-Martin on Île Jésus, for example, he was commissioned between 1787 and 1798 to make the side altars, two bas-reliefs, the pulpit, the churchwardens’ pew, three sets of candlesticks, the paschal candlestick in Louis XV style, and the high altar. In 1790 the Grey Nuns of the Hôpital Général in Montreal ordered from him a high altar, and a side altar consecrated to the Sacred Heart; the latter attracts attention because of its exceptionally pleasing contours and the harmonious distribution of the decorative reliefs carved on the flat surfaces. Between 1791 and 1798 he made an “altar of Roman inspiration,” a pulpit, and a churchwardens’ pew for the church at Saint-Cuthbert. From 1792 to 1799 Liébert worked on a high altar for the church at Vaudreuil; its arrangement is dense but not overloaded and reveals the artist’s very considerable facility. Behind the base of the crucifix dominating the tabernacle door is an Ecce Homo, familiarly referred to as the “beautiful Lord” of Vaudreuil, which is one of the wood-carver’s masterpieces. On 18 May 1795 Liébert joined forces with his son-in-law Jean Gaston, a confectioner. The two rented from Basile Proulx a house on Rue Saint-Jacques in Montreal in which they both lived and carried on their respective professions. They shared the profits and losses, the purchasing of materials, and other expenses such as the wages of the shop boys and servants, housekeeping costs, and food. The agreement provided for a 10-year association, but on 1 October the partnership was dissolved. Gaston then owed his father-in-law 900 livres to cover the investment in furnishing his café. The following year Liébert moved to the precinct of the convent of the Grey Nuns, with whom he signed a lease for life. The rent was moderate but the nuns also profited by doing the gilding for Liébert’s carvings. Between 1799 and 1803, under a contract with the fabrique of Sainte-Rose on Île Jésus, Liébert made the candlesticks, the crucifix, and a high altar with baldachin, decorated with two remarkable statuettes representing St Rose and the Madonna and Child. Many other less important contracts had come Liébert’s way in the course of his long career. Although his religious wood-carving may be quite easily traced through parish ledgers, it is more difficult to know whether he pursued his art in other spheres. Given the customs of the period and the inventory that was made of his estate after his death, it may be assumed that he did some work in wood-carving for civil institutions, some fine cabinet-making, and even religious and civil architecture. In the spring of 1804 Philippe Liébert cancelled his lease with the Grey Nuns and went to live in the faubourg Saint-Laurent, where he died on 27 September, leaving an estate in excess of 9,000 livres. An accomplished and prolific craftsman to whom some paintings – such as the portraits of Louis Normant* Du Faradon, Mme d’Youville [Marie-Marguerite Dufrost* de Lajemmerais], and Étienne Montgolfier* – are also attributed, Liébert represents a high point in late 18th-century art. AC, Joliette, Minutiers, Eugène Archambault, 2 déc. 1834. AD, Seine-et-Marne (Melun), État civil, Nemours, 9 août 1733. MAC-CD, Fonds Morisset, 2, L716.4/P551. Michel Cauchon, “LIÉBERT, PHILIPPE,” in Dictionary of Canadian Biography, vol. 5, University of Toronto/Université Laval, 2003–, accessed April 26, 2019, http://www.biographi.ca/en/bio/liebert_philippe_5E.html.